“Eyes of the Dragon” Mystery Machine in Action! Just a quick post -here is a short video of my “Eyes of the Dragon” Mystery Machine in action! AW177 “Eyes of the Dragon” Mystery Machine for the Tenacious Toys Candy-Coated Custom Show! I was invited by Benny of Tenacious Toys to be a part of their first custom toy show, the Candy-Coated Custom Show. The show was held on April 21, 7-9pm at The London Candy Company, 1442 Lexington Ave. New York, NY 10128. Here’s a peek at the second of three customs for New York Comic Con 2010 – “Tiger Fury” Elite Division Warrior #2! This is a custom 5″ Mad*L collaboration between Kevin Gosselin and myself. Kevin is an excellent sculptor/artist and I was really happy to have been able to work with him on this figure. Kevin did all the sculpting to resemble an ancient Chinese (terra cotta) warrior, while I did all the artwork. Kevin sculpted it to fit my art style and allowed much surface area for me to do my thing while still maintaining the look of a warrior. I posted a pic of what one of my collaboration Mad*L customs w/ Kevin Gosselin looked like yesterday and today I posted some pics of the blank sculpt that Kevin came up with. Go to my Flickr account for some great pics! Thanks and more to come! 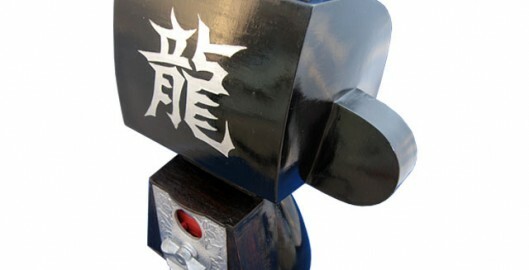 Here’s a peek at one of my customs for New York Comic Con 2010 – “Dragon Power” Elite Division Warrior #1! This is a custom 5″ Mad*L collaboration between Kevin Gosselin and myself. Kevin is an excellent sculptor/artist and I was really happy to have been able to work with him on this figure. Kevin did all the sculpting to resemble an ancient Chinese (terra cotta) warrior, while I did all the artwork. Kevin sculpted it to fit my art style and allowed much surface area for me to do my thing while still maintaining the look of a warrior.